I’ve been a fisherman for most of my life, although for the past twenty-five years my fishing has been limited to a couple of outings a year. I very much relish those occasions when they arise, especially the trips back to Missouri to catch Rainbows and Browns on a fly rod. But something has happened recently that has given me the unique opportunity to relive the beginnings of my fishing experience, back to when I was a boy. My grand-kids are now old enough to take fishing. And being the good old Pops that I am, I see it as my duty to take them fishing and teach them the ropes. Last fall my son and I took Cara, who was three and a half, and Jake who was almost five, fishing at a local retention pond. With red and white bobbers, pinch sinkers, Eagle Claw hooks and a Styrofoam container of night crawlers, we slaughtered the bluegill and other assorted sunfish that day. There was a lot of oohing and ahhing and giggling to go around, and it was a delight to watch the two kids touch, or not touch, the worms and fish. And It was a delight for me to relearn how to set the hook and catch a panfish using a bobber and worms. I’ll never forget the day and it only whetted my appetite for the next outing. Well, the next outing happened this past weekend, and you aren’t going to believe what went on down at the neighborhood pond. Julie and I were privileged to have Jake over the weekend and the weather was warm for April; and I was in a fishing mood. Julie volunteered to pick up the night crawlers (she called and asked if I wanted 30 skinny ones or 15 big, fat, juicy night crawlers and you can guess which ones I chose). I asked Julie if she would like to come along and surprisingly she said yes. I’m observant enough to realize that she only came because Jake was coming. Funny thing how that works; when we were dating she would join me on my fishing outings on a regular basis, but once she put that golden ring on my finger she forever declined to accompany me thereafter (camping for Julie is staying at a Holiday Inn). Anyway, whatever the motive, she enthusiastically agreed to join us. The day arrived and we loaded up Jake, his two foot Iron Man fishing pole, my pole, and some snacks, and drove the two blocks down the street to the retention pond. At the pond we set the bobbers about a foot and a half above the hook and immediately started catching bluegill. 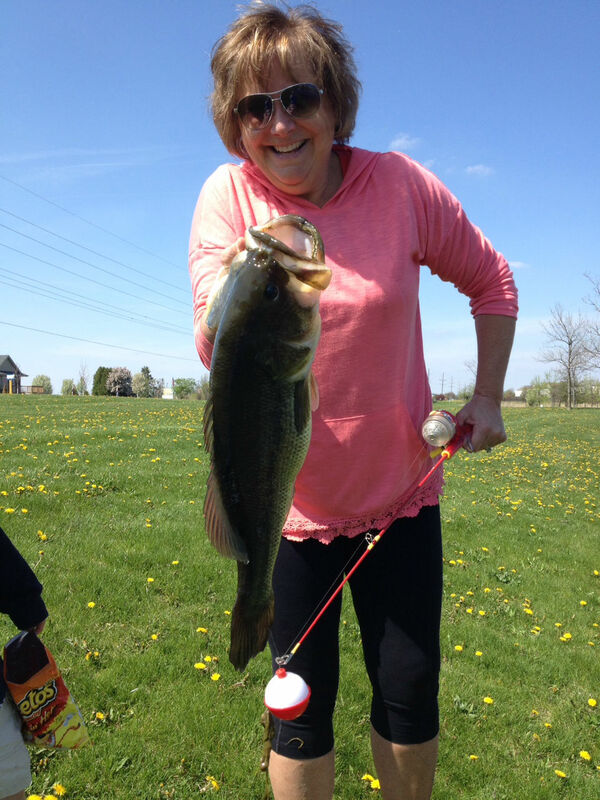 Jake was more than generous and allowed his Gigi to take turns using his two foot pole and they both became proficient at setting the hook and reeling in eight inch whoppers, one after the other. Needless to say, I was the worm putter-onner and fish taker-offer, but hey, I’m here to serve. Watching Julie reel in the “big one” gave me a special thrill and I wondered if she would ever join me fishing again, assuming she was having such a great time that she couldn’t resist (I later asked her that exact question and she assured me the answer was a resounding no). I should have known it wasn’t going to be an ordinary day when I hooked a three pound bass. With bobbers and worms? Who catches bass this way? Here’s the picture with me, Jake and the bass. After catching that bass, things now stood right with the world. I was catching the most fish and the biggest fish was mine (What kind of man competes with a five-year old for biggest fish anyhow?). But, I was soon to find that my smug attitude and self-satisfied demeanor were about to be wiped off my face, and rather quickly. Shortly thereafter, Jake had a fish on his line that was giving him a run for the money and Gigi and I were shouting words of encouragement as he tugged and pulled for all he was worth. After the fish was dragged onto the bank, I could see it was big. In fact, I hadn’t seen a bluegill that size since I was a youngster fishing with Jim Chittenden down on Dry Fork Creek. 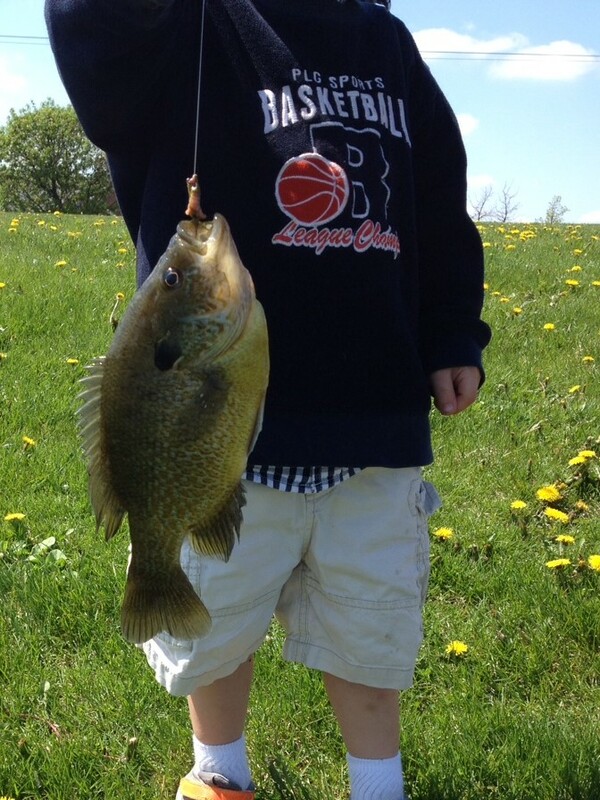 Here’s a shot of the monster bluegill that five-year old Jake landed- on his own. I believe I was more excited than Jake. I could barely put my hands around the breadth of that fish. Huge! Anyway, it couldn’t possibly get any better than this. Or could it? After a few moments of epic struggle the fight was over, and when the bass was finally close enough to the shore, I reached down and pulled it out of the water. I was stunned. 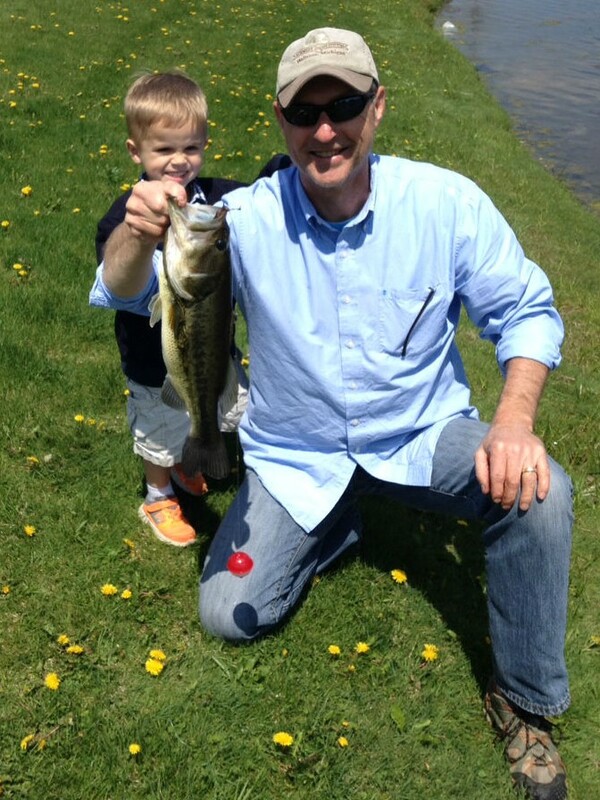 I had once caught a five-pound bass, but this fish could have swallowed my prize whole. It was huge. Julie was so excited, as was Jake, that it was hard to get her to pose for the camera. The picture doesn’t do the fish justice, but you might notice that Julie is having a difficult time holding the fish for the photo. You also might notice the cute little kiddy pole, that someone insisted on purchasing for our grandson, in her left hand. I have no idea how much the fish weighed, but it was the biggest bass I’ve ever witnessed up close. It was of comparable size to so many of the trophies I’ve seen mounted on the walls of fishing tackle stores or in someone’s “man cave”. So, in the end, here’s the final tally for the day: Jake caught the largest sunfish of the day and Julie caught the largest bass of the day (due to all the excitement, we lost track of how many fish each of us caught). And me? Well, I was the proudest husband and Pops of the day. On a sad note- there’s probably some poor sucker out there who has fished for that elusive trophy bass for over forty years, and spent thousands of dollars on boats and poles and tackle, arisen early and stayed out late, suffered sunburn and backaches and cuts and bruises to body and ego, only to have Julie spend $4 on night crawlers, using bobbers and Eagle Claw hooks, on a $9.99 Iron Man fishing pole, and after no more than a brief afternoon, catch a monster bass like I have never seen before. I won’t tell the guy if you don’t. Nothing quite like a good day fishing. I work with a number of business owners whose livelihoods depend on labor, and the labor market is currently undergoing a major transition as the Baby Boomer generation is retiring and the Millennials are taking their place. Many of these owners have worked with their employees for twenty, sometimes thirty years and as they’ve slowly begun to lose them, they are finding it difficult to understand this new generation of employee. I most often hear them lament that the new generation just doesn’t have the same work ethic as the old. But what does that mean? And how are the two generations work ethics different? I’ll first describe my generation, the Baby Boomers, with most of my observations coming from personal experience, and then I’ll attempt to describe the Millennials; my descriptions of them coming mainly from observation and first hand accounts and from reading articles on the subject. Remember, as in all generalizations there are plenty of exceptions to go around, but within the generalizations, there are usually elements of truth. The Baby Boomer generation perceived work as the primary purpose for their lives, and in fact work defined them. “What do you do?” was a question a Baby Boomer might ask when meeting someone for the first time, rather than “What’s your name?” or “Who are you?” or “What do you believe?” or any other qualifier that describes a person. You were known as a doctor or a lawyer or a librarian or truck driver or teacher or businessman; whatever the profession, it defined who you were. Your attitude upon starting your job was first gratitude at being offered one, but then it was doing whatever it took to please the boss and do well. If the boss said, “Jump,” your response would be, “How high?” It might be a year on the job before you even thought about asking for time off. Work came before any other considerations. Before family events, leisure time, holidays, family meals, etc. My typical response when asked if I was going to attend any number of extracurricular activities was, “I have to work”. It wasn’t an option. And sick days? Who got sick? I remember my first career job as an assistant manager at Wal-Mart. I had just been promoted from “management trainee” and was told (not asked) to move, along with my family, to a neighboring state in order to receive the promotion. I had four days to rent a U-Haul, pack up the house, and report to work on Monday morning. I just thought that’s the way things were done and so I did it. And when I worked a stretch of five weeks without a day off, I figured that too was just the way things were done. And staying to close the store until two in the morning and then opening the store four hours later. And working most holidays while the family was at someone’s cookout, and when i finally arrived finding the food cold and everyone else gone home. And the double shifts that started at daybreak and ended at some point after the rest of the world was sound asleep. All expected and never questioned. I had goals in mind and working hard for them was how they were going to be accomplished. My generation had the idea that if you put in forty years or so of hard work, and diligently saved for retirement, when those forty years were over you could then enjoy your leisure for the remaining years of your life. It was all about accumulating possessions, a pension, a 401-K, stocks, bonds, property, land, and then enjoying them at a later date. It’s the old parable of the grasshopper and the ant. The Baby Boomers are the ant in the story. And now for the grasshopper. 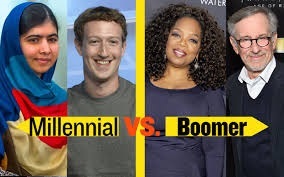 he Millennial’s approach to work is a stark contrast to the Baby Boomers and that causes a major disconnect for the business owners of today. Millennials can take work or leave it. Prior to their first day on the job they present to the boss a list of demands, specific days they need off for a variety of events, and if they don’t have their demands met, they don’t take the job; there apparently being many more where that came from. I’ve heard stories of Millennials asking for a particular day off and when not being granted their request, quitting. For a business owner today, being flexible with a Millennial’s work schedule is just the way things are. In fact, one would probably be better off to let the Millennial write their own schedule. It might ensure they show up to work the next day. Like the grasshopper, they are living for today and don’t have much consideration about tomorrow, let alone forty years down the road. If there’s an upcoming concert to attend and work gets in the way, work will be the first casualty. And working forty years to earn their leisure? The heck with that. After watching their parents work and slave for that someday, and then that someday never happening, they’ve decided now is the time. Why wait? Millennials want their leisure now. They may not have a pot to pee in, but they will pay five bucks for a Dark Chocolate Melted Truffle Mocha at Starbucks without blinking an eye. And their entertainment comes on the cheap, compared to yachts and golf club memberships and outrageous mortgages. Just find a reasonable place to rent, get Netflix, play fantasy football, and indulge in a couple of tats and who could ask for more? if it can’t be done on a smart device, who needs it? And don’t have any kids. The responsibility of raising children would ruin the carefree life they’ve created for themselves. Whereas the Baby Boomers were all about accumulating possessions, the Millennials are all about experiencing pleasure. Today and not tomorrow. Work does not define them; they leave that to their Facebook profile. Where will it all end? Who knows? I can’t blame them at all for their approach. If they can maneuver through life with that attitude, who am I to say it’s a fool’s endeavor? After all, I can’t say that my Baby Boomer approach has worked out for me. I often joke to my wife, after observing my anemic 401-K and the only half of what it was ten years ago equity in my home, that my retirement age has now been pushed into the nineties. Or if things change for the better, I can become a Wal-Mart greeter at age seventy-five. Now wouldn’t that be a hoot? I recently attended an author’s book signing/reading at a local library and I was intrigued by the questions being asked of her by the audience. Being an author myself, I thought of how I might, if in her shoes, answer the questions she was being asked and how my answers might differ from hers. One question she was asked related to the characters in her books. Were they drawn from people she’s known? Were the settings familiar places? Her answer surprised me. She said that her characters were made up and did not come from real life. Maybe she felt the need to give an evasive answer to protect herself from lawsuits, I’m not sure, but in thinking of the characters in my stories, I would have to admit that most of them are derived from people I’ve known, whether briefly and superficially or for years and intimately. It may be a personality, a physical trait, or because that person had a profound impact on me, but somehow using real people gives me a foundation from which to start and a recurring visual as a reference point while I write. Once I have the foundation, I can then add layers as the character develops. The settings for my stories are also familiar to me, which is different from the author who didn’t place much emphasis on it. Whether it be a tree-lined street in a small town, a river winding through the mountains, or the inside of a house I once visited, my stories all reflect places from my life’s experience. I’ve been there and I can see it. I’ve often thought the mind is like a computer and for fifty-three years (pre-writing life) files were uploaded into my mind, hundreds and hundreds of them, one after the other. Files filled with people and places and things. From the time I was a small child until the present. And I was running out of capacity. And because I have a great memory, for the past five years (writing life) my mind has been doing a subsequent download–not to be confused with a document dump–and the process doesn’t seem to be slowing. Of course with our extremely litigious culture, there will be the obligatory disclaimer at the beginning of each book: This is a work of fiction. The events described herein are imaginary. The setting and characters are fictitious and not intended to represent specific places or persons. If you say so. Another question asked of the author was how she puts her stories together. Does she start from the beginning and write all the way through until the end? I’ve found that once I have the general plot for a book, I have a tendency to break it down into chunks. I often begin with an opening scene and then write individual stories within the overall narrative. In most cases, I write the ending early in the project. Once I have the beginning and end, all that’s necessary is to fill in the remainder. Not so easy that. I may dwell on a particular part of the story for days, thinking about which way I want the story-line to go. On a good note, this process allows me the freedom to create, but it also gives me many decisions to consider, and that’s where the work initiates. But it’s a rewarding work. An additional question the author was asked involved the when of her writing. Do you have a set time or routine in place as to when you do your writing? For her, now that her children are in school, she has a definite routine; she’s up at five thirty and begins writing with her first cup of coffee and once the kids are off to school, she has the entire day for writing until they come home in the afternoon. I would love her writing schedule and hope to be in a similar place some day. For now, I write when I can, and in my case, this is much more complicated and sporadic. Since I still have a full-time career, I have to work my writing in wherever and whenever I can. I travel a lot for my job and find I’m most productive in my hotel room, from six o’clock until I fall off to sleep. And since I travel, I find that while I’m driving my mind is running about as fast as the engine of the automobile, which isn’t necessarily conducive to good driving skills. 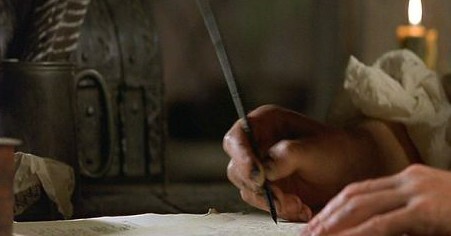 Sometimes ideas will come to me and I feel a need to write them down or email them to myself in order not to lose them. Other times I just mull an idea, over and over, and never really come to a conclusion, but I realize that massaging process is important to the final result. In addition to driving, the other activity I find to be the most creative for me is when I’m walking my dog. A final question for the author was asked by me. 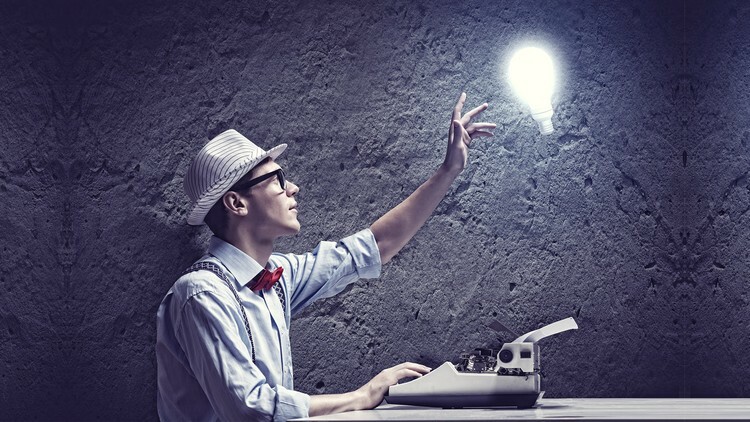 Do you find the querying process and the accompanying rejections to be discouraging or frustrating? I knew when I asked the question that she might respond that her manuscript was accepted on her first query, which would have discouraged me more than I already was, but I took the risk nevertheless. Her answer not only surprised me, but gave me much encouragement. Her first book had taken her five years to write. In addition, she told the story of sending out over one hundred query letters, and receiving either a rejection or no response, which is in reality the same thing. And then she endured silence for two years before someone showed an interest in her manuscript and offered her representation.